Constructionarium Ltd provides a 6-day working field trip for undergraduates following construction related qualifications based at our site in Bircham Newton, Norfolk. We are looking for a part-time Administrative Assistance to join our busy site team until the end of June 2018. This position would ideally suit someone who is looking to maintain their level of administrative skills which fit in around school hours or other commitments. We can be flexible on daily working hours but would anticipate the successful candidate will work no more than 15 hours per week. We seek a friendly, well-spoken and organised individual who can multi-task and prioritise, with at least five years’ previous experience as an administrator. Excellent written and spoken English is a must, as are good MS Office skills. As this is a site based role, you will need to have a full driving licence as we are remotely based in Bircham Newton. Constructionarium Ltd is a not-for-profit organisation. From 2nd January 2018, we will be moving from our offices in Camberley to London. Our new office address will be Constructionarium Ltd, c/o Construction Industry Council (CIC), The Building Centre, 26 Store Street, London, WC1E 7BT. 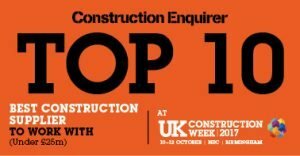 We are delighted that Constructionarium Ltd. has been short-listed as one of the Top Ten companies in the Construction Enquiries Award – Best Construction Supplier to Work With (Under £25m). We are up against nine worthy contenders and the winner will be announced in October. Many thanks to all those that voted for us and your continued support! With many thanks to the Chartered Institution of Civil Engineering Surveyors and in particular Abigail Tomkins for another great article about Constructionarium. Read it here. We are delighted to announce that Caroline Boyden has been appointed Admin. Asst. and joined our site team at Bircham Newton. It is with great sadness that we announce the passing of our dear friend and colleague Alan Mack. We were privileged to have worked with him and he will be fondly remembered for his work within the construction industry and support to Constructionarium, but more importantly for being a charismatic and fair man who saw through work to the more important matters in life. He was very popular with the students, who benefited from his wealth of experience and mentoring during our Constructionarium weeks. He will be sadly missed by all who had the pleasure of meeting him. Our thoughts and condolences go out to his family in these difficult times. On 8th December 2016 we were delighted to host a return visit of HRH The Duke of York. Nick Raynsford, Constructionarium’s President said “I am very pleased that His Royal Highness showed so much interest this unique learning experience and the difference it makes to emerging talent not only in the UK but also on a global scale.” Click here for a copy of our press release. The event enabled the team to bring guests up to date on Constructionarium’s progress, as well as hearing from four previous students (from University of East London) and University of Southampton) who have been able to utilise the experience of Constructionarium in their career search post-graduation and secure work within P J Careys and Sons Ltd, Costain, Hockley and Dawson; and NMCNomenca. Constructionarium Ltd received £2.3m capital funding for its Bircham Newton site expansion in 2014 from CITB. The extended site opened in March this year and, with the support from CITB, hosted an open day to showcase the extended facilities. Constructionarium were pleased to see that it received a positive turnout and generated interest from future industry partners and potential attendees. The Constructionarium group have seen more students, over 1000 attend at our various sites – Bircham Newton, Blackridge in Scotland, Newcastle and Queensland Australia. Both Newcastle and Queensland were pilot sites for us for which we are now reviewing ahead of 2017. In their main hub at Bircham Newton, 845 students attended from 23 academic institutes which included five USA universities. Joe Chandler, Constructionarium’s newly appointed site manager has done an excellent job in ensuring the weeks run smoothly and ensuring that the zones are ready for student’s arrival each week. Scotland increased the number of students and industry partners that participated during 2015/16 and this is due to the hard work undertaken by David Sibbald (Constructionarium Scotland) and his team. At the end of June, Constructionarium partnered with Owen Pugh for a pilot which was hosted in their quarry in South Shields. The students that attended were a mix of students from Newcastle University, Newcastle College and Newcastle Met. College. Constructionarium Ltd would like to thank John Dickson and Jan Elliott for their support in making this event happen. A few weeks later it was Australia’s turn to run pilot. Feedback has been very positive thus far and already there has been interest from other academic institutes to attend later this year. Back at the hub in Bircham Newton, we have also added a new project, Canary Wharf Underground Station. We developed this project in conjunction with LUL/TFL. A successful pilot was completed in July and we look forward to this being used by other attendees going forward. The project came from previous attendees who found the experience so rewarding, they encouraged their Managers to use Constructionarium as a part of their Emerging Talent programme. At the start of the academic year, we hosted another industry organisation – Multiplex, who used Constructionarium as part of their graduate induction process. This week was very successful in embedding the company’s health and safety behaviours, working ethos and company values and Constructionarium Ltd look forward to seeing them return again next month to the Bircham Newton site. As the Constructionarium model links an academic institute with a contractor and consulting engineer to deliver the experience, it was delighted to welcome J.N.Bentley Ltd.’s support for the first time this year. Constructionarium welcomes any other organisation that wishes to work more closely with an academic institute (HE, UTC or FE) to contact Robin Holdsworth for more details. During the luncheon, Constructionarium were able to share with the guests the video which was produced in March in conjunction with CITB. This gave guests the opportunity to see our extended facility at Bircham Newton and to hear from some participants. Click here to watch the video. Whilst it was a reflective event, it is worth reporting that 2017 is set to be even busier for us with repeat bookings from every academic institute that attended in 2015/16 and with the University of East Anglia and Sheffield Hallam University joining us for the first time. Lastly, the Constructionarium Board – The Rt. Hon. Nick Raynsford (President), Stef Stefanou OBE (Chairman), Richard Haryott (Director) and the Constructionarium team – Robin Holdsworth (Scheme Director), Julia Stevens (Development Manager), Joe Chandler (Site Manager), Tom Barton (Industry Partnering Manager) and Dave Armsworth (Health and Safety Manger) would like to thank all the students, academics and industry partners for their continued support in making Constructionarium the unique success it is today. It’s been very busy for us this season, 29 academic institutes, over 1000 students attended one of our four sites, significant site expansion at Bircham Newton and project development work. Thank you to all that have participate and made it so successful. Our newsletter is out, click here to read. the launch of a new website. Alexander Stevinson and Stavrini Charilaou from the University of Nottingham gave excellent presentations of the learning and work they and their teams undertook whilst at Constructionarium. Dr Tom Cherrett premiered the University of Southampton’s video they made of this years attendance, which can be viewed on our media page or by clicking here. We had several new organisations attending the luncheon and hope that these new links will materialise into new Industry Partners going forward. Last Week for 2014/15 – what a year! It’s been very busy for us this season, 18 academic institutes have attended, 900 students, site expansion, development work and a royal visit. Thank you to all that have made it happen. We were delighted that HRH the Duke of York accepted our invitation to visit us. He joined us on our last week, seeing University of Birmingham students undertaking Ravenspurn Oil platform and Kingsgate bridge, supported by Interserve and Morgan Sindall. The feedback has been very positive. As you are reading this you will see our new style website, which we feel is more reflective of the work we undertake. As always, we welcome your feedback via jstevens@constructionarium.co.uk. The new year is here and we are busy preparing the site for the fifty students who will be on site w/c 8th March 2015. The last week in October 2014 saw forty-five students (a mix of QS, Construction Management and Civil Engineers) undertake three projects at our Bircham Newton site. The projects were Ravenspurn Oil Platform, Kingsgate Bridge and The Gherkin. The Secretary of State for Scotland, The Liberal MP from Orkney and Shetland visited Sibbald Training in Blackridge Armadale on Thursday 9th October 2014.